Early map identifying the mythical cities of gold, Quivira and Teguayo. A New Map of North America from the latest and best Authorities. 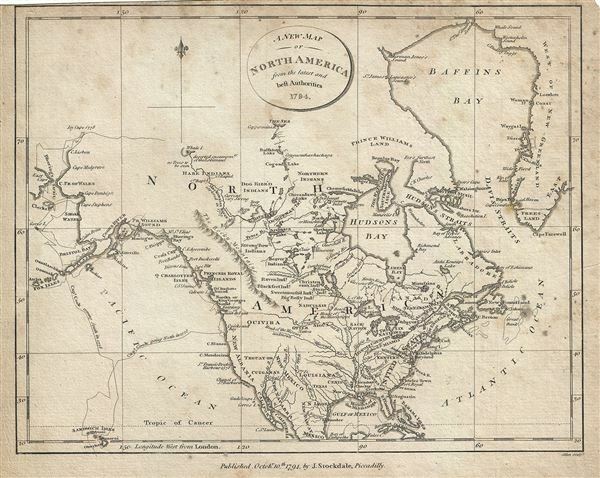 This is an appealing 1794 map of North America by John Stockdale. It covers from Baffin's Bay south to Cuba and Mexico and from the Bering (Bhering) Strait east to Greenland. It offers fine detail throughout, noting several rivers, lakes, bays, cities and several other topographical features. American Indian tribes are noted throughout and Captain CookÃ¢Â€Â™s voyage through the Pacific has been identified. The Teguayo Nation appears in the unmapped region to the west of Santa Fe. Teguayo was associated with the Seven Cities of gold and the 16th century explorations of Coronado, to be found in the unexplored American west. It most older maps Teguayo is associated with a large lake, sometimes saline, that was briefly mentioned in the journals of the Coronado expedition. While in older maps the name appears sparingly and in various formats, sometimes a lake, sometimes a river, sometimes a city, sometimes a land, it was generally forgotten until the outlaw governor of New Spain, Diego de Penalosa, discovered references to in the famous 'Benevides Memorial' along with Quivira, another mythical kingdom. Quivira, along with Cibola, was one of the Seven Cities of Gold from Spanish folklore. The story beings in 1150 when Merida, Spain, was conquered by Moors. The city's seven bishops fled the city taking with them much of the cities riches. Legend told that they each founded a great city in a faraway unknown land. With the discovery of the New World and the fabulous riches plundered by Cortez and Pizarro, the Seven Cities became associated with New World legends. Coronado, hearing tales of the rich Aztec homeland of Azatlan somewhere to the north believed he was hunting for Quivira in what is today the American southwest. Father Benavides was a Franciscan missionary active in New Mexico in the early 17th century. Benavides was eager to attract royal support for his evangelization projects and consequently wrote a stunning report of the wealth of the regions of Quivira and Teguayo. It was probably Benavides that first connected the two lands, but following his public embarrassment and loss of status as New Mexico Governor, Penalosa fled to England and France. There he used the Benavides Memorial to promote a scheme of revenge against the Spanish crown. Penalosa attempted to convince the monarch of France and England to invade part of New Spain in order to conquer a vast new Kingdom called Teguayo. Though the plan never bore fruit, Teguayo was consistently present on maps well into the 19th century. This map was issued by John Stockdale in his 1794 edition of The American Geography; Or, A View of the Present Situation of the United States of America. John Stockdale (March 25, 1750 - June 21, 1814) was an English book and map publisher active in London in the late 18th and early 19th centuries. Stockdale, born in Caldbeck, England, was trained by his father in the family trade of blacksmithing. Blacksmithing must not have been his cup of tea, for as soon as he was able, he left this trade in favor of a number of minor service positions, working at various times as a porter and a valet. One such position put him in the service of the bookseller John Almon. Having learnt the book trade by observing Almon, Stockdale opened his own bookshop and began publishing various historic and scientific works. Fellow publishers, perhaps reacting to his social status at birth, wrote of him, "being a man of natural parts, he soon became conspicuous in business in spite of much eccentricity of conduct and great coarseness of manners." Never quite accepted in the trade, Stockdale's fellow London publishers derogatorily referred to him as "The Bookselling Blacksmith". Nonetheless, Stockdale had a number of important works to his name, including several geographies, most notably the 1794American Geography 1794 and, with John Cary, the 1805 New British Atlas. Stockdale, J., The American Geography Or, A View of the Present Situation of the United States of America, 1794. Very good. Some spotting. Narrow top margin. Rumsey 0632.001. Philips (Atlases) 1361.